Two men stood in the doorway of the Ubyssey office, timid amidst the bustling daily crowd and goings-on. I wouldn’t have known they’d arrived, had one of them not been so tall he could be seen over the cubicles — in fact, his 6’4” presence is the only thing that made me notice they were there at all. I walked them to the back of the office and sat down with them. They remained quiet, calm and collected as I started the recorder. In hindsight, that’s not necessarily surprising and perhaps perfectly personifies the team they represent. Every week, the swimmers just keep training and racing. They don’t have regularly hyped events, they don’t have head-to-head match ups. They are out of the spotlight. And yet, every week, they are some of the top-performing athletes on UBC’s campus. The two men are the swimming team’s captains. One, a fifth-year who coaches within the Aquatic Centre. The other, a third-year Canadian national team up-and-comer. 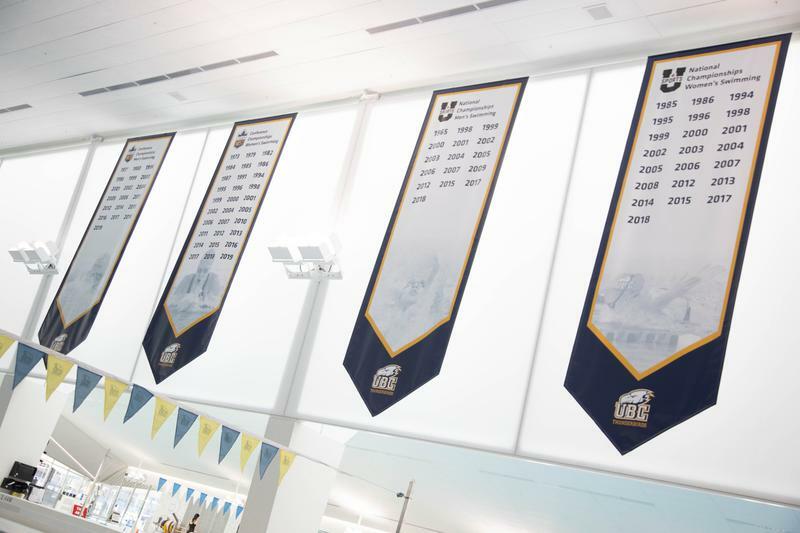 Though both took — and continue to take — very different paths through the sport, they are arguably the faces of the hidden treasure that continues to make waves at UBC's pool. It’s their first year as captains, and Connor Wilkins and Markus Thormeyer are leading the UBC team into a home-hosted national championship from February 21 to 23. Suddenly, campus is focused on them. “[I’m] going to be honest: swimming does some amazing things and no one hears about it. So we get excited when UBC is like, ‘hey, we want to do a photoshoot with you guys,’... or when [The Ubyssey] comes to us like, ‘hey, let’s get some profiles done,’” Thormeyer said. “I’m pretty individually-oriented, so I’ve never cared so much about that, but it’s still pretty cool,” Wilkins echoed. As the veteran in the captaincy pairing, Wilkins got his start in competitive swimming later than most; he didn’t formally train until he was around 10 years old. He always liked swimming lessons growing up, so he settled into the sport from there. He had to make the choice between soccer and swimming, as is the story of many athletes across different sports. Evidently he stuck to the pool. For 6’4” Thormeyer, when he first tried swimming lessons as a child, the now-Canadian team member surprisingly didn’t show much promise. “I took a bunch of swimming lessons growing up when I was younger … and I was actually really bad and [the instructors] kept failing me over and over again,” he said. He circled through the rotation of sports similar to Wilkins, before veering back and settling into the pool. “I ran through basically every other sport and ... I was so bad at all of them. Soccer, like anything on land [I was] awful,” he said, laughing. When his brother decided he wanted to join a competitive team, Thormeyer followed suit to keep the family together. Though taking a timid, apprehensive start to his career, he grew to love it. “I think I just invested so much time into it and I was like, ‘let’s see what I can do here,” he explained. Their paths to UBC, though, are where their stories diverge. For Wilkins, UBC was always in the plan. Though he’s from Oakville, Ontario, his connections to the West Coast brought him to UBC. “I always wanted to do varsity swimming, but I didn’t decide specifically which school until I was in my last year of high school. UBC has a really good team and it’s really nice [here]. My dad’s whole side of the family is from here, and he went to UBC and my grandpa was a professor here,” he said. Thormeyer’s initial plan was to head down the States for school but fateful training sessions on UBC's campus kept him in his home province. It also made sense for him to come here given that the Canadian team also trains on campus. But that workload between school, varsity and Canadian training can take its toll — and it did two years ago. He took a break from the sport, evaluated why he was swimming, his priorities and how to not overwhelm himself. And he came back. “All my friends are [swimming], I like winning, I like seeing what I can do,” he said of why he returned. 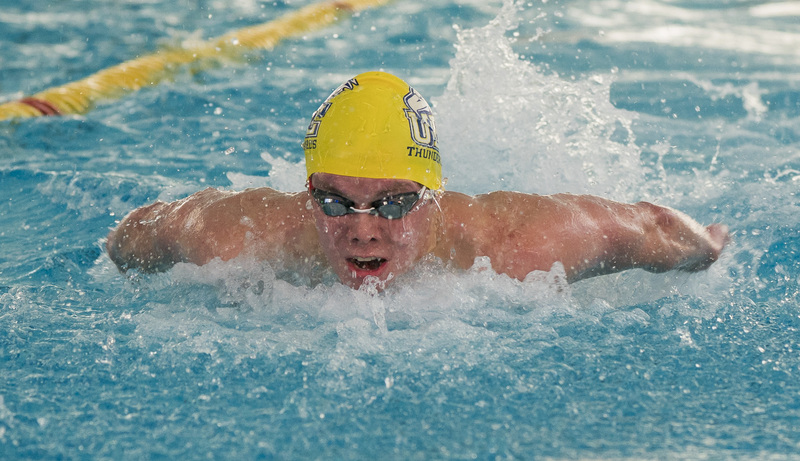 Now in his third year with the UBC roster, Thormeyer thinks he’s got that school-swim balance mostly figured out. Since returning to the sport, he has won his first major international medal at the 2018 Commonwealth Games: a bronze in the 100 metre backstroke. He claimed a gold medal in the 2018 Canadian Swimming Trials in the 200-metre freestyle. This past November, he set a new Canadian record of 1:52.12 in the 200-metre backstroke. He was named the 2018 male athlete of the year in Canadian swimming. “It’s just a balance, finding what works for me. How much school I can do and how I balance it. But I think I’ve figured it out recently, and my swimming has gotten better and school’s gotten better,” he explained. For Wilkins, he continues to participate in the sport by coaching kids at the Aquatic Centre in the summer. 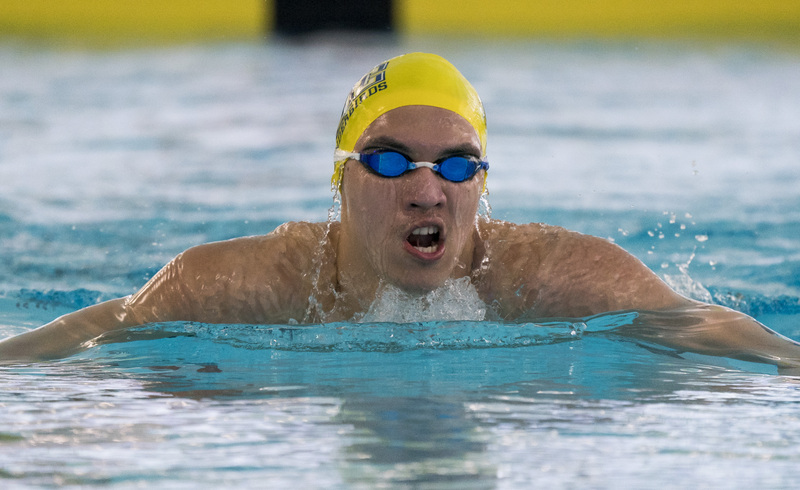 And while both have very different storylines outside of the UBC swimming roster, it’s the combination that works in the team’s favour, alongside their similar, collected demeanour overall. Both agree they are leaders by example and leave teammates to come to them if they need anything — hands off, but exemplary. It’s a golden mindset, and one that perhaps exemplifies everything it means to be a UBC swimmer today. Competitive. Humble. Continually doing their thing and finding their way back to the pool — no matter if the spotlight is on them or not.